Not long ago, Dan shared an awesomely detailed article about being careful about bandwidth usage on your super high speed fiber optic Internet line in Japan. 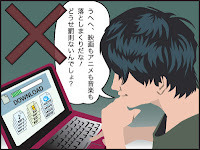 Although Internet providers in Japan have for several years kept an eye out for excessive file sharing or downloading and used Terms of Service violations to cut such users' connections, in Japanese law it had not been illegal for users to download copyrighted content--only uploaders of such content could face legal charges... until now. Last Thursday (June 21, 2012), a recent proposal in the Japanese Diet was passed into law: Effective October, 2012, residents of Japan downloading copyrighted content can face a prison sentence of up to 2 years and/or a fine of up to 2 million yen (approximately $25,000 USD), plus damaged claimed by the copyright holder. In comparison, an uploader of copyrighted content can face up to 10 years imprisonment and/or a 10 million yen (approx $125,000) fine, plus damages. From 2006 to 2009 a special committee of the Agency for Cultural Affairs discussed the possibility of illegalization of downloading copyrighted material. A proposal was made in the Diet on June 15, 2012 where it was pushed through in a brief five days with an overwhelming majority vote. Like similar laws in the West, though, it will be necessary for the content owner to file a claim and provide proof of illegal activity in order for an individual to be charged. The law specifically makes allowances for copyrighted material to be copied into a browser cache, meaning normal usage of sites like YouTube remains legal... and thus splits some hairs about when data residing on a hard drive becomes illegal. When an individual is charged, a cease and desist letter will first be issued to the address registered to the Internet connection by certified mail. An additional instance of illegal activity after receipt of the document will be considered sufficient evidence for prosecution. Comprehensive details and updates are available at the Illegal Downloading Laws Wiki (Japanese only). Enjoy our articles? Follow us on Facebook and Twitter for all the latest updates.